Cannabis is an annual plant that flowers from late summer into fall. The natural growing season begins when farmers plant seeds every spring; these seedlings quickly develop branches and leaves over the next few months, becoming taller and bushier until longer nights after the summer solstice trigger the flowering phase. In autumn, when flowers are ripe, they are cut down, dried, and trimmed before entering the market. Wherever cannabis cultivation occurs outdoors, consumers typically enjoy an overabundance of fresh flowers after the yearly harvest. Commercially grown outdoor cannabis is sold cheaply and speedily in late fall and winter. States with legal cannabis sales often experience drastic shifts in supply and demand as farmers flood the market with product while some consumers turn to homegrown or cheaper black market sources. Top-shelf sungrown cannabis becomes available more gradually in the winter and early spring. By midyear, stockpiles dwindle and prices rise as surplus turns to scarcity. How Do Environmental Factors Affect Cannabis’s Growing Season? In the northern hemisphere, seeds are planted as early as March or as late as May, and flowers are harvested from September through November. Seasons are reversed in the southern hemisphere, so planting takes place from September to November and harvest time is March to May. In the tropics, near the Equator, it is actually possible to harvest outdoor cannabis throughout the year. A cannabis plant switches from the vegetative to the flowering stage when the days get shorter and the nights get longer. The precise timing varies depending on latitude. A strain that starts flowering in early July when cultivated in California or Colorado should not flower until August in Canada or Holland. In Hawaii, that same strain may be capable of flowering at almost any time. Temperature, altitude, rainfall, and other environmental conditions also influence cannabis maturation and determine the ideal growing season in any given location. Mild weather encourages plants to finish sooner, whereas excessive heat or cold can delay flowering and ripening. Do Different Strains Have Different Growing Seasons? Strain genetics have a significant impact on growing season. Cannabis varieties adapt to their native habitat, and breeders create strains that are best suited to the local climate. 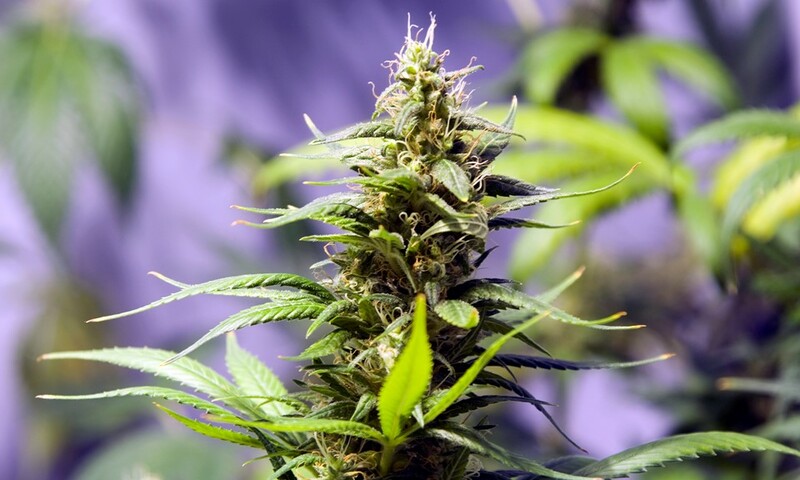 Generally speaking, indicas stay shorter and flower faster than their sativa cousins, while equatorial sativas have the longest flowering time and may not survive long enough to ripen when grown too far north or south. A strain developed in a cool coastal area will likely finish early when grown in a warm inland region. While landracesand old-school strains tend to be more demanding, modern genetics have been designed to deliver higher yields in a shorter period of time. DJ Short, creator of the iconic Blueberry, reports that the second to third week of October is his favorite time to harvest his signature indica strain in Oregon, where he lives. But he waits until late November or even December to harvest certain sativas. The cultivators at Shine On Farms endure increasingly wintery weather at their off-grid farm in the hills of northern California’s Anderson Valley, long after the growing season has ended for their friends and neighbors, as they wait for their beloved Super Silver Hazeto finish flowering. How Do Cultivation Techniques Influence Cannabis Growth? Cultivation techniques, strategies, and preferences affect the growing season as well, and farmers make calculated decisions based on their experiences and objectives. Many believe it is better to plant when the moon is waxing and harvest when the moon is waning. Guerilla growers sometimes plant later in the season, a strategic decision resulting in smaller plants that are easier to conceal from law enforcement. Regulations such as plant count limits incentivize some legally permitted cultivators to plant early in order to grow larger plants. When flowers ripen in the fall, farmers must choose the most opportune moment to harvest. Flowers that are harvested early induce a lighter, more cerebral high, and flowers that are harvested late have a more narcotic body effect. A later harvest also leads to increased risks from mold, mildew, pests, and damage from frost or storms. Ed Rosenthal, the “guru of ganja,” considers cannabis perfectly ripe when the trichomes turn to a milky or amber color, but notes, “this is about a week later than some people prefer.” In his Big Book of Buds, Rosenthal complains that the cannabis for sale in Dutch coffeeshops is often immature, which results in a “racing and buzzy” high that he finds unsatisfying. “Obviously, ripening time is affected by your idea of ripeness,” he concludes. Mendocino farmer and activist Casey O’Neill, who writes for The Ganjier, says, “There are about as many methodologies for harvesting cannabis as there are cannabis farmers.” Because crops frequently ripen all at once, and harvesting is an arduous and time-consuming process, O’Neill says, “It is better to start harvesting early and finish on time, rather than starting on time and finishing late.” O’Neill also appreciates the high bestowed by “fewer amber trichomes and more clear to milky ones,” which add “a kiss of ephemeral lightness,” avoiding the “sedative, opioid effect of the amber trichomes.” He explains that his indica-dominant strains would be “too heavy for the modern consumer” if they were allowed to ripen more fully. Once plants have been harvested, they must be dried to reduce water content and remove chlorophyll. Plants should be hung in a climate-controlled room for 10 days to two weeks, although some claim that as few as five or six days can be sufficient and others insist that two weeks is the minimum. According to Franco, of Green House Seed Co., “The difference between drying 10 days and 14 days is not very evident to the novice, but creates a world of difference to the connoisseur.” Flowers that are dried too rapidly will have a harsh or bitter flavor, and flowers that are too moist will not burn. Meticulous handling, hand-trimming, and proper storage differentiate craft cannabis. Small family farms may lack the resources to trim an entire crop all at once, and instead trim continually for several months. Swami Select has found that flowers can maintain optimal freshness for a year or longer when stored in black ultraviolet glass jars in a cool dry space. Therefore, although cannabis harvest naturally occurs at the same time each year, different quality buds may arrive at your local dispensary at different times over the course of the year. Of course, modern cannabis growers are not constrained by the seasons. By cultivating in greenhouses and periodically blocking out light to simulate longer nights, farmers are able to use the sun’s energy to power three or more harvests per year. These greenhouse-grown flowers — commonly known as “light dep” — are of particularly excellent quality when allowed to ripen under the peak summer sun in late June and July. Meanwhile, innovation and electricity have made it possible to maintain a constant supply of cannabis throughout the year: a hydroponic indoor grow with staggered light cycles, for instance, can generate at least one harvest every month, ensuring a perpetual supply of fresh indoor-grown flowers year-round. As such, you’ll never arrive at your local dispensary to find it empty due to cannabis being out of season. That said, consider the fact that while you can find fresh produce at the grocery store all year-round, when locally grown fruits and vegetables are in season they are unequivocally superior. If you are fortunate enough to be in the right place at the right time, the same principle applies to seasonal sun-grown cannabis.